SAS controller can access SATA drives but that’s not true the other way around. SAS and SATA drives can operate in the same environment while SCSI and ATA cannot. For example, using faster SAS drives for primary storage and offloading older data to cheaper SATA disks in the same subsystem, something that could not be achieved with SCSI and ATA. CAM provides a formal description of the interfaces in a SCSI subsystem. Benefits: providing round-robin prioritized transaction queuing, guaranteed transaction ordering even during error recovery, and a straight forward error recovery model that increases system robustness. CAM is not perfect, a lot of issues related to implementation of the standard. More to come about CAM and RAID. I am still a novice user of spectrwm. When my Lenovo T420 died on me because of low battery, I decided to find out how to add battery life info on the status bar. 1) 32 bit host cannot have 64 bit guest – which was not the case for me. 2) Machine should be virtualization capable – it is. from /var/run/dmesg.boot, it should have VMX or SVM under “Features”. 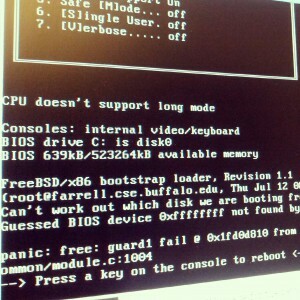 3) Virtualization support should be enabled in bios – it was enabled. 4) Use of incorrect qemu binary – that was the culprit. On this first launch, it does FreeBSD install from the specified iso to the .img file. 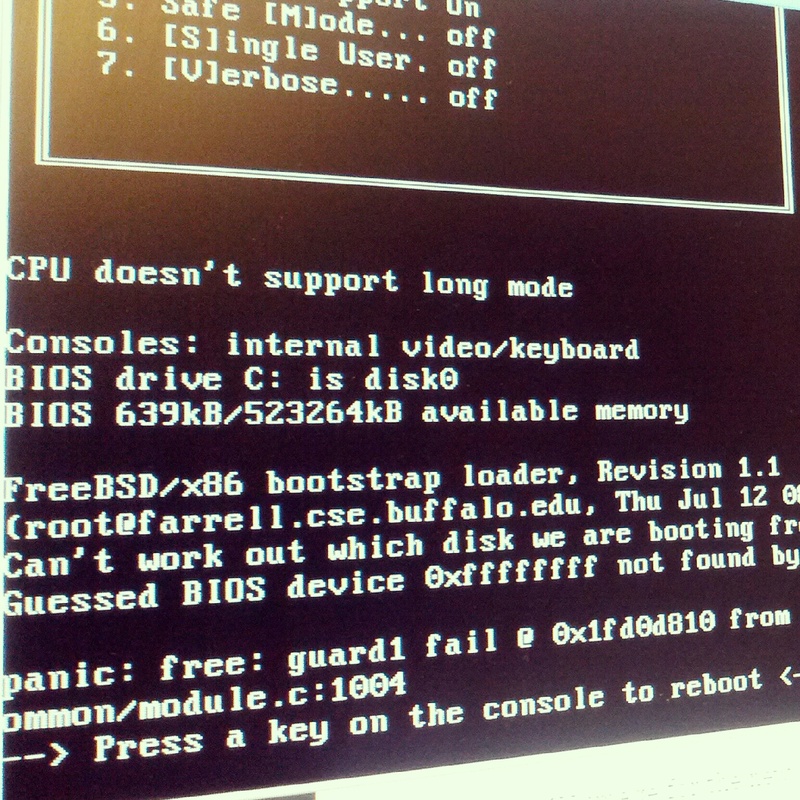 This is a typical FreeBSD installation process. Thanks to FreeBSD foundation for sponsoring my trip to BSDCan2012 This was my first time attending BSDCan and had a lot of fun and learning. – how can the dependencies be maintained easily? so that change in one port does not break other. – Before updating my port how can I know what all would break from the changes? – Who are all vendors/ppl here? What companies are they from? Who do they represent? Why they are here? – What do you like/do not like in FreeBSD. – What do you have that you can push to head. – What is nice to have (features you like). – what was promised in last vendor summit and by whom? what is the status of that project? – backporting BHyVe to lets say 8.0 is _hard_. Got a nice caffee mocha from “Second Cup”. – Usual ssh configuration related things. – Stupid mistakes ppl make. – Replace passwords with public-keys i.e. pass-phrases. – Port forwarding / Reverse port-forwarding. – TEO – TCP Offloading Engine. – gre(4) – neeed fixing, small enough – Email bjoen. freebsd IPv6 todo – a lot is yet to be done. – Look at loader and userboot code – understand how it works. – still experimental but reboots can be really really fast. no pf-ipf – doesnt really matter. – Dtrace with Jails? – can be done? – Trimming freebsd to 8 MB? with FLASH, things are easy. how? This was one of the most fun parts of BSDCan. – motto: Shut up and code! 1) lpd daemon should be enabled and running. This entry will start lpd on next reboot. You can also setup different filters. Look up “man printcap” for the details.